When the producers of Rudolph, the Red-Nosed Reindeer ventured into Saturday Morning TV, they brought along a 60-ton gorilla with his own soundtrack album. Released January 1, 1966. A Videocraft International Production. Executive Producers: Arthur Rankin, Jr., Jules Bass. Producer: William J. Keenan. Associate Producer: Larry Roemer. Writers: Bernard Cowan, Ron Levy, Lew Lewis. Story Editor: Cherney Berg. Music: Maury Laws. Theme Song: Maury Laws, Jules Bass. Recording Supervision: Bernard Cowan. Sound Effects: Frederick Tudor. Engineers: Stephen Frohock, Bill Giles, Bill Dowding. Character Design, Jack Davis, Rod Willis, Paul Coker, Jr. Running Time: 28 minutes. Voices: Bob McFadden (Narrator); Billie Mae Richards (Bobby Bond); Susan Conway (Sue Bond); Carl Banas (Professor Bond). Additional Voices: Alfie Scopp, John Drainie, Paul Soles. King Kong presented Saturday Morning with a lot of “firsts.” It was the network series debut of Rankin/Bass, the first Japanese-made series for network television (Astro Boy was syndicated), and (if you don’t count Rankin-Bass’ syndicated stop-motion New Adventures of Pinocchio) it was the first American-originated hand-drawn series to be produced in Japan. Rankin/Bass worked with Toei Animation on the production end; the scripting, design and voice work done between New York and Canada; and the music was recorded in England, much as was done with Rudolph. Many of the same cast members were also involved, most noticeably Billie Mae Richards, who voices the Red-Nosed Reindeer and Bobby Bond. Susan Conway, who plays Bobby’s older sister Sue and has the distinction of starring in the very first Videocraft (Rankin/Bass) TV special, Return to Oz, as Dorothy. Rounding out the main cast is Carl Banas as Professor Bond, who can be heard introducing all the episodes of the Rankin/Bass Festival of Family Classics series. One of the many voices Banas also performed was the original Sweetums for the Muppets’ TV special The Frog Prince, also produced in Canada. Bernard “Bunny” Cowan shepherded this fine group of artists not only for several Rankin/Bass projects, but also for the classic Spiderman series of the mid-sixties. 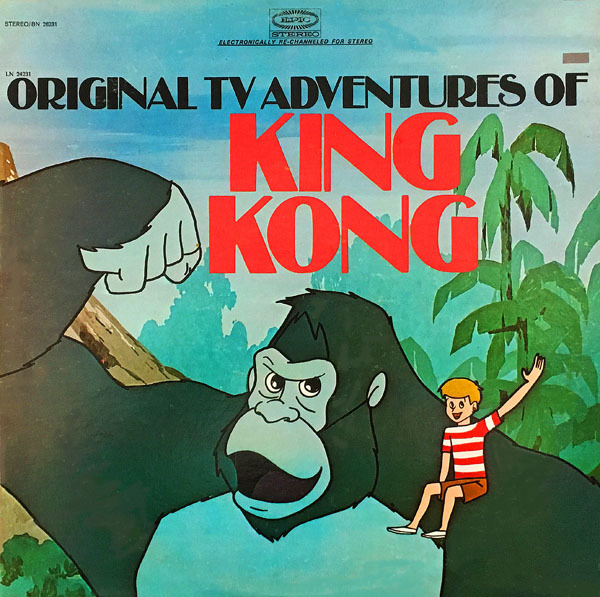 ABC launched the animated King Kong in primetime with a one-hour special on the Tuesday before its Saturday Morning series premiere, right before The Beatles cartoon. Like Japan’s Gigantor or Johnny Sokko, the premise had lots of kid appeal: a youngster with a huge “pet” who is his loyal protector against bad guys—a monster who obeys only the child, not the grownups. The Bonds live on Mondo Island, which never seems to get a moment’s peace because mad scientists, natural disasters and other melodramatic challenges seems to come along every seven minutes or so. The album includes four of these adventures. The tracks are actually in mono, but Epic added some reverb and expansion to create a wider “hi-fi” sound. The stereo disc is basically a glorified mono disc, but that’s not a real problem unless a second-hand record dealer is trying to make you pay extra for the stereo version. There isn’t that much difference. King Kong was such a successful series, Rankin/Bass looked into making a live-action feature film loosely based on its premise. The first attempt didn’t come close enough to please Arthur Rankin, so Toei changed Kong to Godzilla in the script and the film became Godzilla vs. The Sea Monster. The second attempt became 1967’s King Kong Escapes, the first Rankin/Bass live-action American-Japanese co-production, released by Universal. 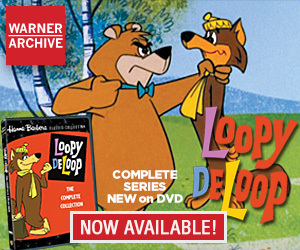 While it is not a note-for-note adaptation of the cartoon, it carries over the evil Dr. Who (dubbed by Paul Frees in the feature), the Mondo Island setting, and the generally benevolent Kong. The film has been in wide circulation since its release, developing a loyal following, so much so that Universal recently released a Blu-ray edition. 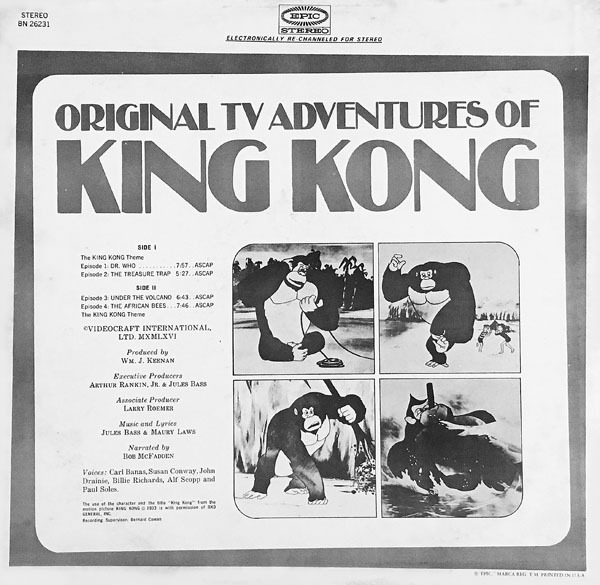 The King Kong theme was also recorded by Al Hirt on his RCA Green Hornet album. 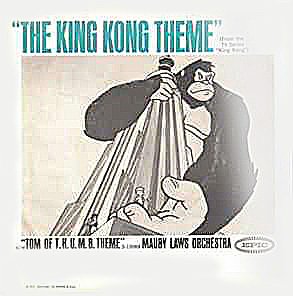 Maury Laws himself conducted a completely different arrangement of the Kong theme on a 45 RPM Epic single . 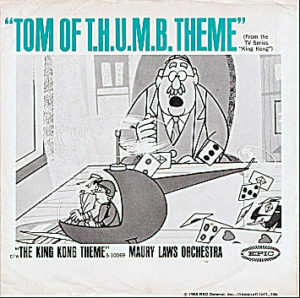 On the other side was the theme from the cartoon that was shown between the two Kong adventures in each TV half hour: Tom of T.H.U.M.B., an odd spy spoof that was sort of like Inch High Private Eye. This album is the only place to find both the opening and closing versions of the unforgettable theme (“Ten times as big as a maaaaann! FRENCH HOOORRRNNN! BOM-BOM-BA-BOM!”) This Maury Laws/Jules Bass classic, along with the background score, will be immediately familiar to those who watched the show, but also to those who know the music of other Rankin/Bass films. When Burgermeister Meisterburger proclaims, “So be it!” in Santa Claus is Comin’ to Town, for instance, one can hear a similar French horn bellow. What is also very noticeable in the King Kong music is the 60’s Bond-style jazz that was even more prevalent in Laws’ score for 1967’s Mad Monster Party. No memory whatsoever of this series. Usually I have at least a vague recollection of the shows you write about, but nothing for this one. I Remember that Al Hirt also had a recording of the theme from King Kong that was released. I do remember this. I even correctly remembered the lyrics. I don’t remember it being on tv for more than a season or two, though. For years Carl Banas had his own evening radio program on CKFM in Toronto; that’s the first I knew of him and then later made the connection reading TV credits (He was also Shaeffer the sheepdog on The Raccoons). His son was in my first year studying Animation ’80-’81(a pretty good artist; I don’t know what happened to him). I remember it, but wasn’t Sue named Susan (after her portrayer)..there was a series like Hanna-Barbera’s 1973 “Inch High, Private Eye”, with a small sized (only by drinking, not birth as in HB’s series), “Tom of T.H.U.M.B.”(guess which story the title was from, and it was not a espionage one lol). That DID have a girlfriend for Tom named Swingin’/ Sue, the nickname of Susan, so it is confusin (to coina rhyume) and the coincidence or not of Sussan Conway, but anyway, there’s name correction. There really should be a KING of K.O.N.G. show,lol. Thank you for posting..! ‘King Kong Escapes’ is the greatest film ever made.